Viivi is a former insurance defense attorney. For eight years, she experienced first hand the unfair advantage insurance companies have over individuals. She knows that only through aggressive and skilled representation will an individual obtain fair compensation. In 2007, Viivi left insurance defense litigation and chose to dedicate herself solely to representing individuals who have been injured. Her compassion for her clients and dedication to obtain justice for them is her number one priority. Viivi Vanderslice graduated from the University of Washington in 1995 with a Bachelor of Arts Degree in Political Science and Minor in History. She obtained her law degree from California Western School of Law in 1999 graduating in the top 8% of her class. She received the American Jurisprudence Award (highest final grade in the class) for Torts, Contracts, and Advanced Civil Litigation Practice and Procedure. Viivi is licensed to practice law in the states of Washington, Nevada and California. During her time at California Western, she was an Executive Editor for the International Law Review and a published author in the California Western Law Review. 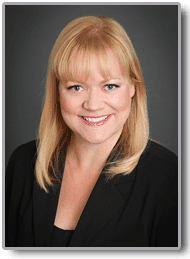 Also during this time, Viivi clerked at one of the largest plaintiff’s litigation firms in San Diego where she helped personal injury victims, including victims of medical malpractice, wrongful death and physical/sexual abuse obtain justice. Viivi is an active member of the Washington State Bar Association and Washington Association for Justice.